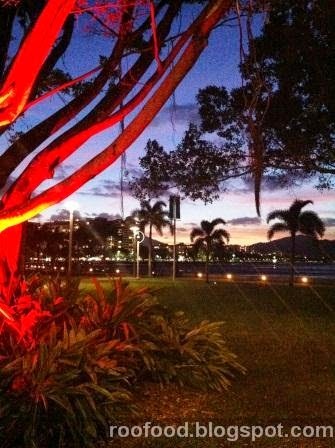 Our first evening in Cairns was fabulous. We left a very cold Sydney and landed in warm, sunny weather and I was excited about spending a week in the sun with my man (although the nights were very cool to cold). 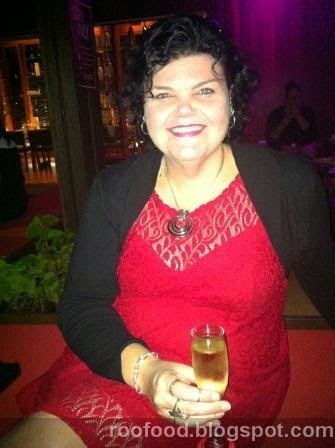 It seems I had been celebrating my 40th birthday for the past few days and who was complaining - so I wanted our first night in Cairns, which also happened to be the first night of our first holiday together, a little bit special. 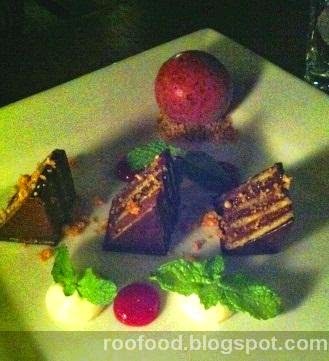 The Salthouse was the only place I wanted to go and belive me when I say I did alot of food research for this holiday. Strolling through the park watching the sunset set and the tree line walkway lit up was magical. I could breath - we were on holidays. We arrived and decided a pre-dinner glass of bubbles was the ONLY way to start the evening (okay we may have already polished off a bottle of Patriache Hermitage on the balcony. The outdoor bar area is lovely (if not a little too cool for this time of year). 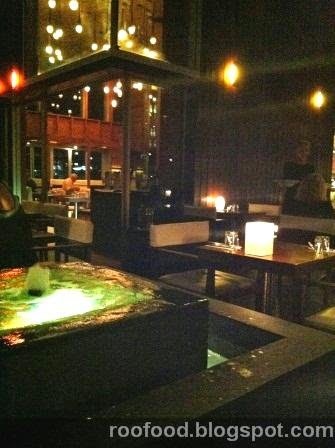 Big comfy chairs and cushioned benches scattered around, soft lighting and bubbling lit fountains. It certainly made for a romantic mood setter. Definitely a tropical and seaside/marine feel to this marina restaurant and bar. Feeling a little peckish we headed into the restaurant and were seated by a bubbling fountain on the outdoor patio area (which is undercover). Salthouse is known for it's seafood, however they also have a woodfired grill which using local ironwood timber. The menu is mouthwatering, however we both knew we wanted the chilled seafood platter. It consisted of king prawns, Moreton Bay bugs, natural oysters (from Tasmania), local red claw crayfish, baby octopus, Tasmanian smoked salmon, glazed yellow fin tuna and matching condiments. 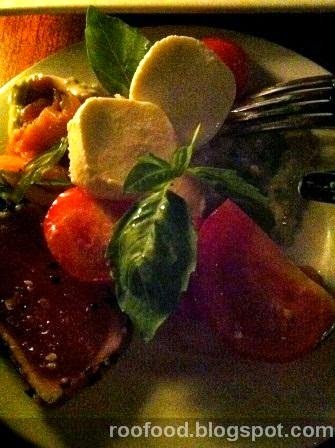 We also added a caprese salad with plump balls of boccoccini, a variety of tomatoes and aromatic basil. We also choose a bottle of the 2012 Fat Bird Saviougon Blanc. Crisp, cold and pairs well with seafood. We cannot help people watch in the restaurant and drooling over others dishes. The woodfired steaks coming out of the kitchen look devine. However, that changed when I had big cheesy grin on my face when the platter was placed in front of us. I was in my seafood happy place and we dug in with gusto. The Tasmanian oysters were sprinkled with fish roe and tasted like the briny sea, fresh, plump and absolutely delicious, in fact the best oysters I think I have ever eaten. I love a good bug and the Moreton Bay bug was simply steamed. Easy picking out the tasty flesh and dunking it in a thousand island style dressing. The local red claw crayfish were yummy and the baby octopus was so tender and juicy. What more can I say. This platter was perfect. Satisfied, content and happy we revel in the atmosphere and the moment and thoroughly enjoy our evening here. 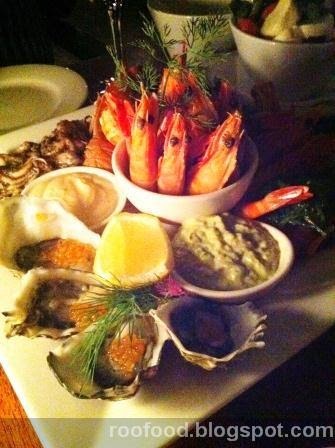 As far as seafood platters are concerned, this has to be one of the best platters in Cairns with a fantastic price tag! Being a Tuesday night, it's quiet and not much happening but we do come back a couple of times during our stay (but more on that another time).